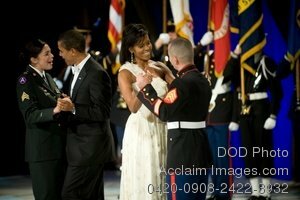 Description: Free, public domain image: President and Michelle Obama Dancing with Enlisted Members of the U.S. Military. President and Michelle Obama share a dance with two enlisted service members at the Commander-in-Chiefs Ball at the National Building Museum, Washington, D.C., Jan. 20, 2009. The ball honored Americas service members, families the fallen and wounded warriors. (DoD photo by Mass Communication Specialist 1st Class Chad J. McNeeley.